File contains the history of Moira Village and the Huntingdon Township, including first nations, french settlers, agriculture, lumbering, churches, population, politics, etc. 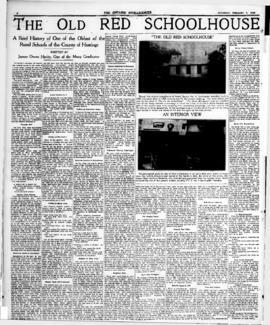 File contains a copy of a newspaper story, “The Old Red Schoolhouse” in Moira Village in Huntingdon Township, one of the oldest rural schools in Hastings County. Three volumes of accounts of the Moira Cheese Manufacturing Company and one volume (with missing boards) of shareholders' minutes and lists of shareholders. This file contains a publicity booklets titled "The Highlands of Hastings And The City of Belleville" published by the County and City of Belleville. Includes local attractions and advertisements for locale businesses.